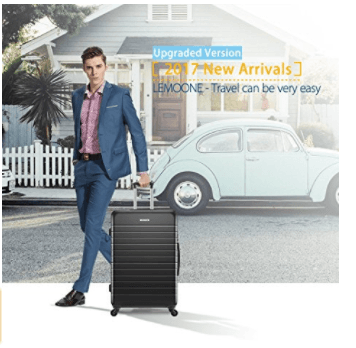 Lemoone Galaxy is a hot new release luggage set of 3 spinner hard shell suitcases with a sleek and modern design. Being made of PC and ABS materials these are impact resistant hard side units with tough exteriors that are also lightweight. The 20-inch bag weighs 5.9 pounds, has a 45 litres capacity and measures 21.3 x 13.8 x 9.1 inches and meets the American airline requirements for cabin bag restrictions. You can get the set in either champagne or dark pink colour (at the time of this review). The PC and ABS make these suitcases resistant to pressure and impact and scratches, tough and light at the same time. They have the 360-degree rotating multi-directional spinner wheels that move effortlessly and smoothly on different grounds, offering great mobility. They include two soft-side handles and a solid and robust retractable chrome telescoping handle that locks into place. Inside you have the zippered mesh on one side and the crossed straps on the other side to help keep your clothes in place. There is even a folding hanger for your suit or dress as well as two mesh pockets for your small items. This is separate from the top large zipper that opens separately for your larger items. The medium 24-inch luggage weighs 7.9 pounds with the 75-liter capacity and the measurements of 25.2 x 15.4 x 10.2 inches. And the largest suitcase weighs 9.9 lbs, has a 95 litres capacity and measures 31.5 x 18.5 x 13 inches, including the spinner wheels. You can store each one into another saving on space, the way you get them shipped to your address. The shipping weight is 26.2 pounds and the package measurements are 30.2 x 21.2 x 12.6 inches. You can use these different size bags for your long and short trips- leisure or business. The smallest one is good for stuff you want to keep close to you during your flight. And the medium size is usually good for trips up to a week or so. You will get the TSA combo lock pre-set to 0-0-0 as with most other suitcases and you may set it to what you prefer easily by pushing the button on the broadside and releasing it. The airport TSA staff can open your bags for inspection without having to break the locks. These suitcases are not expandable but you get quite a bit of space in each one of them. 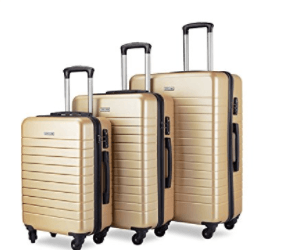 This is a great quality set of three sleek and stylish, solid and durable suitcases at a low price and you get decent customer support. They are designed to give you many years of use. The Lemoone Luggage Set is offered with a two-year warranty by the manufacturer and you can contact the seller at lemoone-service@outlook.com for after-sales customer support if you need any assistance.